Today is the feast day of Saint Joseph of Arimathea on the new calendar. We old schoolers will celebrate it in thirteen days, but I thought that it would be appropriate to post something edifying to the soul today nonetheless. A few weeks ago, I received the July newsletter of the Hermitage of the Holy Cross in West Virginia. The newsletter recounts recent events at the monastery, and it features photographs from a few of the monks’ recent pilgrimage to Russia. I forwarded it to my brother Aaron, as we were able to visit some places shown. The newsletter also contains a segment from The Brothers Karamazov along with a link to commentary by Fr. Stephen Freeman, who keeps the Glory to God for All Things blog. The Brothers Karamazov is my favorite novel, and Fr. Stephen is perhaps my favorite religious blogger. I recommend the post. It deals with an aspect of Christianity that has long troubled me—our religion’s apparent disregard for justice. 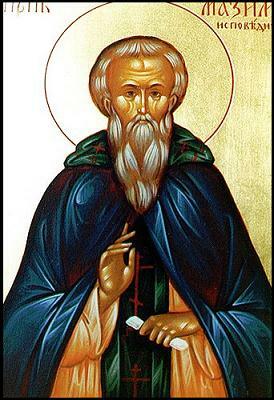 Last week, I posted Saint Romanos the Melode’s hymn for the feast of Saint Elijah, wherein the great prophet has no patience for human wickedness but the Lord, “the only friend of man,” shows endless mercy. Fr. Stephen’s analysis does not resolve the problem for me, but it illumines a promising path that I should probably explore. The only Friend of man. of those who scorn Thee. Thou, the only Friend of man. For the Lover of man is troubled by a few tears. What, then, can I think up in the face of such goodness? And how shall I counteract His mercy ? Is the Friend of man. But if you wish, let us hurry to the Bible and let us read its words. not to supply my mercy to men. I am the only Friend of man. that rain will not be given except by my command. Resulting from the oath that I have made. Groaning and raising their hands in supplication to the All-Merciful. But, on the other hand, He respected the oath of the prophet. He, the only Friend of man. to put an end to the punishment. For it is in truth a fearful thing, the inexorable demands of the stomach! He is the only Friend of man. At once answered Elijah: “Now hearken carefully to my words, and heed what I say. I am suffering, and I hasten to find a release of the punishment. I struggle to give nourishment to all who are famished, for I am indeed merciful. I, the only Friend of man. Of those who had made mistakes; but rather I wished their life. Do not then, expose me as making false promises to them, but welcome my plea. He said, “Let Thy will be done, O Lord. Give rain and life to the one who is dead, and vivify all creation. Pregnant with water, passed over the air, sending down rain in streams. and the woman received her resurrected child. To the only Friend of man. And he took thought as to how an even harsher punishment might be inflicted. But I feel for the sinners whenever they suffer beyond all measure. And you are not able to endure it. “Be set apart from the dwelling of men. But I, as One who pities, shall descend to men and become man. there is no sin there. For the Thesbite was translated in a chariot of fire, as it is written. Christ ascended in clouds among the powerful. He who is the only Friend of man. I agree with the character’s Notes from Underground about the marred nature of man. If ingratitude is not our original sin, it surely is one of the chief marks of our damned race. Not surprisingly, then, is the golden path one of gratitude. I mentioned in “Doxacon Eidomenos” that I had never before heard the akathist that we prayed at the beginning of Doxacon’s events at the Hilton on Saturday, “Glory to God for All Things.” I offer it below in case the linked page ever fails. It makes for an extended statement of how the Christian should relate to the world. There is scholarly disagreement about the akathist’s author. It was composed either by the priest Gregory Petrov who died in a Siberian prison camp (around A.D. 1942) or a bit earlier by Metropolitan Tryphon (Prince Turkestanov), another confessor of the faith who witnessed before Soviet persecution (+ A.D. 1934). From what I have been able to find online, the akathist was found in Fr. Gregory’s belongings, which is why many thought that he had composed the akathist while in the camp. Perhaps, the priest found the hierarch’s hymn beneficial. Maybe, the bishop sent the priest the akathist a decade before as encouragement during the time of troubles. Regardless, it is beautiful. I moreover appreciate the structural nature of akathists in that they end with their beginning. They remind me of Sunday as the first and eighth day of creation. The synod of bishops of R.O.C.O.R. held an extraordinary session last week to review apparent irregularities in the Western rite under Bishop Jerome. Read the official release. It seems as though they are ending the Russian Church’s Western rite, and they have disciplined Bishop Jerome. I find this unfortunate, and I wonder if it has anything to do with the recent apostasy (and apparent insanity) of the newly ordained Nathan Monk, who describes himself on FaceBook as “an author, human rights activist, and a former priest who left the church in order to love and help others do the same” [in order to support the homosexualist agenda]. As I told Andrew, anyone who describes himself as a “human rights activist” is a certifiable arse wipe, and there is no need to look further. However, for those of prurient tendencies, Monk’s online persona is a veritable bacchanalia of smarmy, shallow, leftist self righteousness, poor logic, bad faith, and plain idiocy. That the good bishop would trust such a man for the priesthood raises the question of proper discernment. It could be that Bishop Jerome was so enthusiastic to cultivate the Western rite that he overlooked or ignored many red flags. Sadly, when one treads through the territory of disaffected Anglicans, Old Catholics, and Anglo-Catholics, one has to deal with sordid episcopi vagantes culture. It is a shame; for I feel sorry for those folks and badly for Bishop Jerome. We here have another incident to be added to the arsenal of arguments against the Western rite, to which I am largely sympathetic.